Starters, an entertaining dystopian novel that lovers of the Hunger Games will enjoy, follows our protagonist, sixteen- year old Callie, as she handles a world where only Starters (children and teens) and Enders (seniors over the age of sixty) have survived after the Spore Wars. Filled with mystery, romance, and action, this book will make it difficult to get any work done. After the Spore Wars wipes out everyone between the ages twenty and sixty, sixteen-year old Callie and her younger brother ,Tyler, are left on their own to defend themselves from renegades and squat in homes for survival.Worried about the safety and health of her brother, Callie seeks out her only hope, Prime Destinations, a company that secretly hires teens to rent their bodies to seniors, otherwise known as Enders. Through this company, Callie is given the opportunity to make enough money to purchase a home for her and her brother to live in. 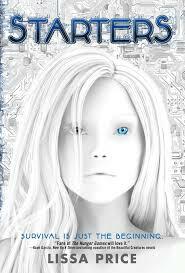 While being rented, the neurochip that Prime Destinations implanted in her head malfunctions and she wakes up in the life of her renter only to find that her renter plans to use her for more than just a chance to feel young again. Starters turned out to be a very entertaining read. I found it impossible to stop thinking about. The plot of the story is filled with many twists and turns that eradicate any chance of a dull moment. The author did a wonderful job at creating a believable character. Callie is a strong, brazen protagonist that does whatever it takes to provide for her younger brother. I have read countless novels where the women protagonist ends up relying on her love interest to save her from any problem that comes her way. Callie is a character that uses her brains and skills to get the job done on her own. If you’re looking for a book that’s not filled with a sappy, cliché love story, this is the one for you. The romance was kept at a tolerable level, but it’s still enough to make you swoon over her handsome love interest. If you’re more attracted to mystery, don’t worry, there’s a slice in here for you. The biggest overshadowing mystery that was constantly swirling through my mind was “What exactly does the renter want to use her body to do?” Slowly piecing the clues together became my newest hobby. I would stay up until the wee hours of the morning trying to figure it out before I reached the end of the novel. To close, I’d like to say that this is a great read. There are just so many different elements in it that readers of romance, mystery, and action can all be drawn to it. The characters are lovable and the plot is entrancing. Just beware, when you pick this up, be prepared to be hooked.